Phenytoin (PNT) is a commonly used sedative antiepileptic medication in many countries. It is used in generalized tonic-clonic (grand mal) and complex partial (psychomotor, temporal lobe) seizures and prevention and treatment of seizures occurring during or following neurosurgery. Adverse effects of PNT may occur even at therapeutic doses and may involve any system. Epilepsy is the most common chronic neurological disorder in human. Various drugs are available for the treatment of epilepsy, but in India due to economical and efficacy issues, phenytoin (PNT) is the most commonly prescribed drug. PNT remains the drug of choice for treatment for grand mal, temporal lobe, and psychomotor epilepsy since it was first introduced in the year 1938. PNT is 5,5-diphenylhydantoin (5,5-diphenyl-2, 4-imidazolidinedione) (Pregnancy Category D). The plasma half-life in man after oral administration of PNT averages 22 h, with a range of 7–42 h. Steady-state therapeutic levels are achieved at least 7–10 days (5–7 half-lives) after initiation of therapy with recommended doses of 300 mg/day. We present a case of PNT-induced gum hyperplasia with ataxia with megaloblastic anemia with hirsutism with sensory involvement. A young girl of 20 years was admitted with gum overgrowth for 2 months, irritability and uneasiness for 2 months, auditory hallucinations for 2 months, and unsteadiness of gait for 10 days. She was a diagnosed case of generalized tonic-clonic seizures and was on eptoin 100 mg tds for the past 5 years. On examination, the patient was conscious and comfortable; vital parameters were normal. She had hirsutism or hypertrichosis and gum hyperplasia. Central nervous system examination reveals higher function derangement in the form of auditory hallucinations, low mood, suicidal tendencies, moderate depression, and insomnia. Other neurological abnormalities were observed as absent ankle reflex both sides and impaired joint position sensations with positive Romberg's sign. Her mean corpuscular volume was 119 and electrocardiogram suggestive of T-wave inversion in II, III, aVF, V1–V6. Nerve conduction velocity was suggestive of distal mixed sensory motor neuropathy. All others investigations were normal. Gum hyperplasia is an abnormal growth of the periodontal tissue. Several causes of gingival enlargement or gum hyperplasia are known, and the most recognized is drug-induced (iatrogenic). Among the causes for drug-induced gingival enlargement, PNT is the most common agent., Other causative drugs are phenobarbitone, amlodipine, nifedipine, and cyclosporine. Gingival enlargement associated with chronic use of the PNT was first reported in 1939 by Kimball [Figure 1]. The local risk factors such as mal-positioned teeth, gingivitis, mouth breathing, physical irritants (such as orthodontic appliances, implants, and filling), poor oral hygiene, poor socioeconomic class, and poor educational status also play their role in the causation of this ADR. PNT accumulates in the brain, liver, muscle, and fat. Its metabolism gets saturated and its rate of elimination varies as a function of its concentration (i.e., the rate is nonlinear). The plasma t1/2 ranges between 6 and 24 h at plasma concentrations <10 μg/ml but increases with higher concentrations. As a result, plasma concentration increases disproportionately even with the small increments in the dose. PNT is largely metabolized in the liver (95%), and principal metabolite is a para-hydroxyphenyl derivative 5-(4-hydroxyphenyl)-5-phenylhydantoin and is excreted in urine. Patient education, withdrawal, or substitution of drug is the best option. Antimicrobials such as macrolides and tetracyclines interfere with collagen synthesis and also lead to increased degradation of collagen. Antiseptic mouthwash – Chlorhexidine gluconate – biotin and folic acid 5 mg OD, flap procedure, gingivectomy, CO2, or yttrium aluminum garnet lasers are used in only in moderate-to-severe cases who are not responding to all the above-mentioned strategies. The prognosis is better if patients maintain regular oral hygiene and plaque control. Chronic consumption PNT causes many ADR. Our patient had gum hyperplasia, hypertrichosis (hirsutism), peripheral neuropathy, sensory ataxia, loss of joint position sense, folic acid deficiency-related megaloblastic anemia, moderate depression, and auditory hallucinations with exsomnia. Good oral hygiene, addition of antiseptic mouthwash, with addition of macrolide antibiotics and folic acid, and change of drug had been considered as her treatment. Monitoring of serum PNT levels and ADRs should be done even when the seizure is under control and especially when there are doubts of early toxic effects. This report also highlights the importance of educating patients and their caregivers about the clinical manifestations of PNT toxicity so that it can be recognized early and treated appropriately. Guidelines for epidemiologic studies on epilepsy. Commission on epidemiology and prognosis, international league against epilepsy. Epilepsia 1993;34:592-6. Lina M Mejia. Drug Induced Gingival Hyperplasia. In: James WD, editor. On Internet Since; 23 October, 2009. Available from: http://www.emedicine.medscape.com/article/1076264-overview. [Last updated on 2016 Dec 09]. Dongari-Bagtzoglou A, Cutler C. Drug-associated gingival enlargement. J Periodontol 2004;75:1424-31. Kimball OP. The treatment of epilepsy with sodium diphenyl hydantoinate. J Am Med Assoc 1939;112:1244-5. 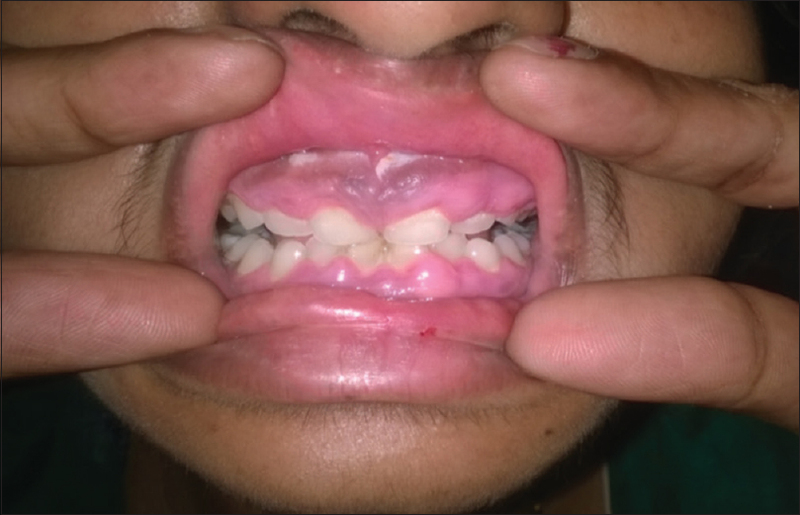 Katz J, Givol N, Chaushu G, Taicher S, Shemer J. Vigabatrin-induced gingival overgrowth. J Clin Periodontol 1997;24:180-2. Casetta I, Granieri E, Desiderá M, Monetti VC, Tola MR, Paolino E, et al. Phenytoin-induced gingival overgrowth: A community-based cross-sectional study in Ferrara, Italy. Neuroepidemiology 1997;16:296-303. Hassell TM. Evidence for production of an inactive collagenase by fibroblasts from phenytoin-enlarged human gingivae. J Oral Pathol 1982;11:310-7. Bolzani G, Della Coletta R, Martelli Júnior H, Martelli Júnior H, Graner E. Cyclosporin A inhibits production and activity of matrix metalloproteinases by gingival fibroblasts. J Periodontal Res 2000;35:51-8.